This is a type of treatment where orthodontic correction is completed in 2 phases, called Phase I and Phase II. This option is for children who have not yet lost all of their primary (baby) teeth, but need to start orthodontic treatment. It is a very efficient way to treat very complicated cases early. It can be considered early intervention and preventative treatment for a few reasons. In Phase I, braces are be placed on adult teeth that have already come in, by doing this Dr. Magoulas can begin teeth movement and/or create or maintain space. In this way the other adult teeth that come in can do so properly and correction of bite problems can get started at a time while growth of bone and jaw is still occurring. Phase I treatment can begin as early as age 7. Phase I treatment, which can achieve several things at once, aligns and straightens the teeth (molars and front teeth), can un-crowd teeth, and align the jaw while the patient is early in their teeth eruption and growth spurt (when the jaw bones are more manipulative). This may prevent the need to have future adult teeth extracted (removed) and may prevent the need for future jaw surgery. Phase II treatment involves treatment that occurs when the remaining adult teeth come in. 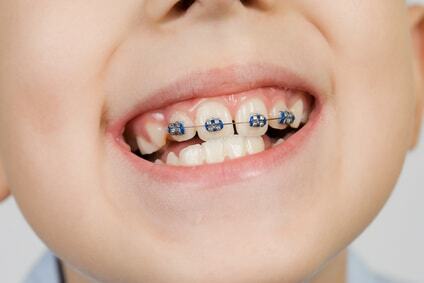 Orthodontic brackets are placed on the rest of the adult teeth and teeth movement and alignment continues. This phase is shorter in duration and serves to create an overall ideal upper and lower alignment of teeth and a better bite. Phase II treatment may directly follow Phase I treatment or be interrupted by wearing retainers while Dr. Magoulas waits for all of the adult teeth to come in. Phase I to Phase II treatment is an excellent way to do preventative treatment and to achieve more ideal orthodontic results.